One of the coolest features that came on the ZL1 was the bi-mode exhaust. With the valves that open up to let the supercharged V-8 roar. But what if you modify your exhaust so you could hear the rumble all the time? 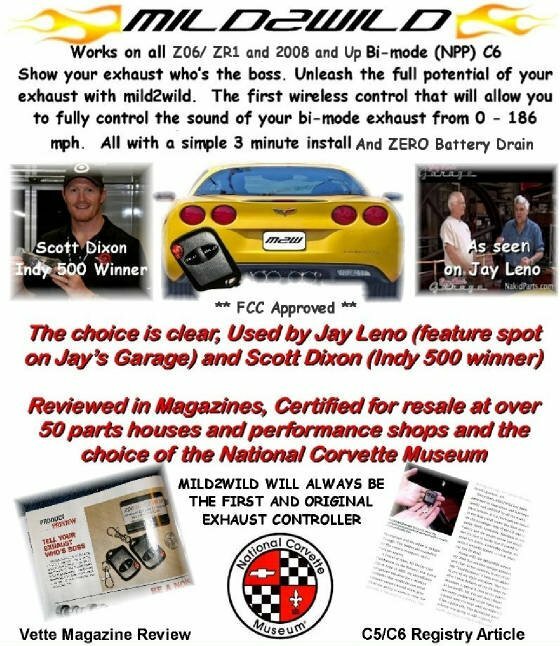 This revolutionary product lets you control your, Camaro ZL1 bi mode exhaust system on demand via a tiny wireless remote or the Homelink feature in your car. One of the coolest technologies is the “bi-mode” exhaust. Whisper quite up until 3500 RPM and then a wide-open race car sound as the flaps located in the tips open. The problem is the inability to control this feature. Up until now, the owner’s only choice was to pull the fuse or to install wiring, drill a hole for a switch to turn the quiet mode off (and these sell for $85). After spending $75,000, the last thing I would want to do is start running wires and drilling holes. Introducing the first and only wireless remote designed to give you full control over the exhaust. This patent-pending product requires no drilling or running wires through your car. It’s a simple 5 min simple plug and play installation that anyone can do. Once installed, you will have full control over the exhaust mode, via a simple ON/OFF remote wireless controller or your Homelink transmitter (simple programming required, instructions provided). Once the Homelink is programmed, you can just use that to work your exhaust. Actually, you will get two sleek ON/OFF wireless controls that can be mounted anywhere and will control the exhaust up to 50’ away. The “OFF” mode gives you that race car sound 100% of the time. The “ON” mode works as the stock setting and is quiet to preset OEM 3,500 RPM. The switch can be used anytime the car is running, allowing you to show your friends what a cool exhaust you have as you can use the remote and open and close the flaps on demand. How cool to stand behind your car and demonstrate the exhaust, using the remote. The system can be removed in seconds and you will never know it was there. You will receive the professionally engineered plug and play wireless receiver, two miniature remotes (batteries included) and the necessary Homelink programming instructions. (I am currently not posting pictures of this product for a number of reasons) Believe me, you will be happy with the quality and fit of this unique product. No refunds or returns on this item. If defective it will be replaced only.